Chinese and Pakistani intelligence agencies are working in tandem to create mayhem in India's north-eastern region. 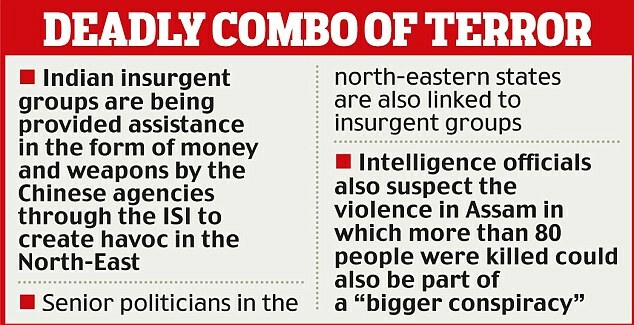 Counter-terrorism officials have gathered intelligence that the Chinese agencies are financing and providing assistance to Pakistan's ISI to keep insurgent groups active in the North-East. The note has been forwarded to the home ministry. According to intelligence agencies, Indian insurgent groups are being provided assistance in the form of money and weapons by the Chinese agencies through the ISI. The issue was also taken up at the conference of the director generals of police held in the Capital recently. Increasing terror incidents in the region, of late, have alarmed the security establishment. 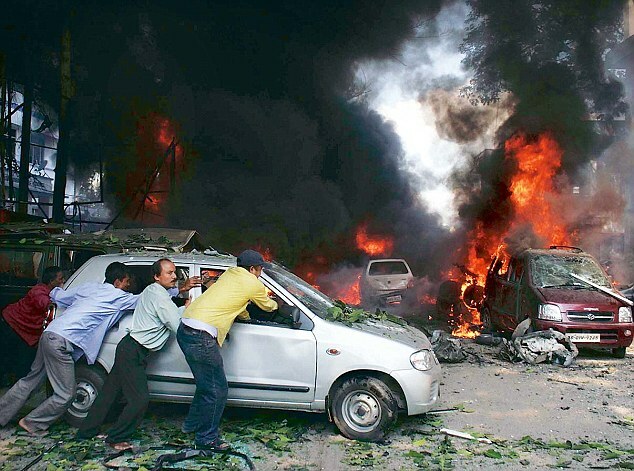 Five blasts have occurred in different northeastern cities in the last two months. Intelligence officials also suspect that the violence in Assam in which more than 80 people were killed could have been part of a 'bigger conspiracy'. The officials believe that the nexus between the Chinese agencies and the ISI is well organised as it serves the purposes of both sides. 'The ISI doesn't have to pump in its own resources, which are provided by the Chinese. On the other hand, the Chinese intelligence agencies can maintain deniability of any involvement at international forums as there is no direct evidence,' said a home ministry official. The linkages of the ISI, which has a strong base in states such as Assam, Tripura, Meghalaya and Manipur, with the Chinese agencies have become a major cause of concern in India. Experts believe this is a deadly cocktail of terror that is being used to destabilse the country. 'Till the mid 1970s the Chinese were directly involved in creating trouble in North-East. 'Later the ISI started building a network. Now what we have is a deadly mix of Chinese motivation and ISI hostility that is supporting insurgent groups,' Ved Marwah, former IPS officer who also served as governor of Manipur and Mizoram, said. 'The situation is getting from bad to worse. Senior politicians in these states are also linked to insurgent groups,' he added. Another issue of concern is the porous Indo-Bangladesh border that has been a safe passage for terrorists wanting to enter North-East. There is credible evidence that this too has been used effectively by the ISI. A recent intelligence input about the possibility of a group of terrorists entering Assam from Bangladesh to exploit the volatile situation after the riots in the state is a case in point.